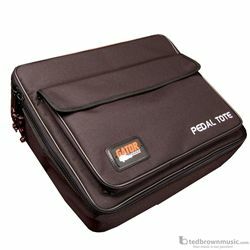 Wood Pedal Board 16.5" x 12" with Black Nylon Carry Bag. Includes G-BUS-8 Power Supply with 9V & 18V Outputs. Plywood pedal board covered in Tolex, with carry handle which slides into a rugged nylong padded carry case. Pedal board has access holes for cables to run below board to utilize 4 supplied mounting screws for most multi-output power supplies. Exterior pockets for cables. Face of pedal board covered with velcro for attaching pedal attachment. (Velcro included) Powered version comes with Gator's G-BUS-8 mutli-output power supply which can power up to 11 standard stomp boxes.